And seriously, had no one referenced http://xkcd.com/1214/ before? Looks to me like the survey towers and all the work they have been doing is to calculate this doted line she has drawn and work out where the new land will be so they can plan ahead and prepare for the watery invasion. I know this is obvious but I thought I would just state it anyway. taixzo wrote: Ooh! New prediction: charlie_grumbles is GLR in disguise! Pre-post edit: And stop posting for a second so I can submit this post! No, I said that many many newpages ago. Right after the Incident, I think. Well. I put up a perfectly good theory about the Caspian Depression like 20 seconds before GLR actually shows us a map of the Balearic Abyssal Plain. Phooey. jjjdavidson wrote: Do we now know the season? The coastline they walked along goes north-northeast, but they commented later about having the sun in their eyes all morning. So is it high summer, with the sun rising far to the northeast? Second question: If the Straits of Gibraltar closed tomorrow, how long would it take the Mediterranean to evaporate this far, assuming no portals to Mars? About 1000 years, give or take, is the current estimate. I'd like to point out that it's considered inevitable that Gilbraltar will pinch off again. Tectonic motion is slowly closing the Mediterranean, and that will close the strait ... however, our current date estimate is far, far too soon for that to occur naturally due solely to tectonic drift (the estimated date for that to occur isn't until 650,000+ years from now!). So there's still quite a bit of mystery to investigate. What happened to the Mediterranean to trigger the Second Messinian Salinity Crisis? What happened to breach Gilbraltar again? nickjbor wrote: I've been following from day 1 BTW, I just have not had much to say until now. I'm glad you both de-lurked! irino wrote: This castle seems to be right there, especially if the beanies have imprecise mapping. OMR, irino! You live in Prunetucky??!! I'm, like, 45 minH away from you! That is so funny! edfel wrote: I'm sticking to "Chateau d'If", on Montecarlo rock. The last words of the book "Le comte de Montecristo": <<Attendre et espérer>>. To wait and to hope. No! OK, that seals it for me. And the pix that Ximenez posted. Gedeon wrote: The beanie language bothers me. They are in Europe, why does their language not resemble anything similar to european languages? Someone, I think CasCat, mentioned this also, but could it be related to Basque? Basque isn't related to any known language. I for one think this is VERY exciting! I feel like this isn't the end, but the beginning of more adventures. Yay! OK, now I'm off to play in a production of La Cage aux Folles, set, you guessed it, in France on the Mediterranean. IT IS ALL RELATED! Great Manip Gedeon! I didn't see the link to the Med. Sea until I saw your map. I think some folks are missing that C and M's river is on the north of the Sea, with a dotted line to the sea. Their people are chirping mustard. We really got the latitude right. I feel like a sailor or something. I've been kicking myself for not considering the Mediterranean before today. I used the north coast of africa as a limit. I'll believe that Time is ending when we find out out who La Petite is. And even then it could go on another 3000 newpix with Cuegan, La Petite, and the Beanies going on a quest to stop the sea or save the people in danger because of it. A story like this doesn't end when you get all the answers in the span of a day. Edit: If it is ending soon, then maybe GLR is planning to end when this thread hits 1190. Last edited by wizpretz on Fri Jul 19, 2013 1:51 am UTC, edited 1 time in total. I also think the map showed too much. It looks like the map could have gone from Gibralter to Sardinia and just shown the merest part of the African continent and still worked for the story. Sure, we would have figured it out anyway, but it seemes like too big a reveal. Last edited by NetWeasel on Fri Jul 19, 2013 1:53 am UTC, edited 1 time in total. Qalyar wrote: What happened to the Mediterranean to trigger the Second Messinian Salinity Crisis? What happened to breach Gilbraltar again? Let's not forget... we're still missing Antares. 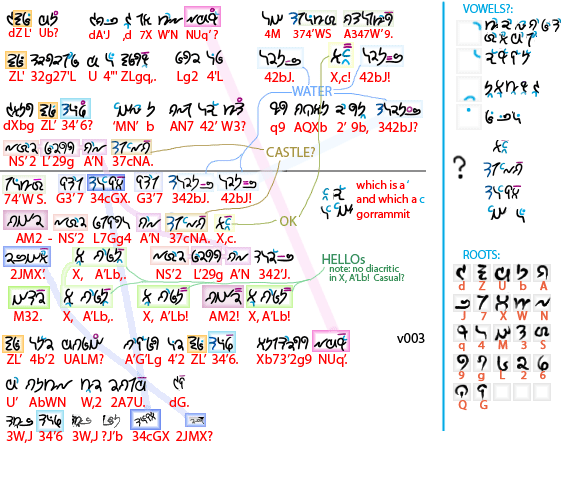 Transliteration updated with map squiggles. SinusPi wrote: Transliteration updated with map squiggles. Antares went supernova, and that's what dried out the Mediterranean? One thing that's a bit bothersome is that there's a small discrepancy in the latitude; when they stopped for the starry night they had to have been at least 42 degrees north, but the astronomy showed 40 degrees. That's pretty darn close, but both estimates (from the map and from the star motion) have pretty narrow error margins, so I'm surprised they don't coincide closer still. Someone mentioned that the earth's axis could itself could shift by a couple hundred kilometers in the time scale we're talking about. Can anyone confirm this? That could close the remaining gap by shifting the actual latitude of the site (ideally, by about 225 kilometers south). I'm not sure a star, even a supernova, would put out enough light/heat to do that. Also, it takes a long time to dry out an ocean, and a supernova only lasts a few days or weeks. Last edited by yappobiscuits on Fri Jul 19, 2013 5:26 am UTC, edited 3 times in total. Just finished my "lurk-up" (ketchuping while lurking); just in Timea to see this "big reveal". I don't think that this is the "End Of Time" at all. -A shoutout to edfel and his mapping skills. 180km in 4 days makes 45km/day, which is really possible on flat ground with very little weight to bear. 210km uphill would take maybe 6 days, which seems consistent too. edfel wrote: Well, that was an exciting discovery tonight...but it's molydown time for me. -In spite of us having a "precise" location; since this is happening in the future, I guess the Randelversarians are also correct. -One stray thought that stuck with me while readingc: I thought "Beanedette" was the name to the female student we saw when the group was coming up the hill. a Has that pun ever been used around here before? c Started on NP 1129, was current with newpix at M2897, so was live when "the Great Stall" happened earlier. I joined y'all with my concern, I just wasn't on the same page as you. Last edited by pelrigg on Fri Jul 19, 2013 2:16 am UTC, edited 1 time in total. moody7277 wrote: Antares went supernova, and that's what dried out the Mediterranean? I'd not put it past Randall to have them connected; Antares is supposedly close enough for its supernova to have some effect, and it's a heck of a coincidence. @Gedeon: re: this map: Brilliant! Baobabish! nickjbor wrote: What evidence do we have that this is the future VS evidence that this is the past? Well, if it were in the past, it would be after castles, which is fairly recently. It would be contrary-to-fact, whereas if it is in the future, it would merely be speculative. Also, stars tell a lot. (They even chirp). @charlie_grumbles: Thanks for the clarification on the Romani. I edited my original post to reflect it. Latent22 wrote: The text from the OTC seems to suggest it's not human related but not sure. That's what Rosetta wants the Cuegan to believe. They are gaining the Cuegan's trust. As the story develops, we'll see if that trust is warranted. I do not see this as the end of Time. I see this as the end of the setup for the conflict that will drive the main part of the story, yet to come. Languages don't last. What 11,000 year old languages are spoken today? 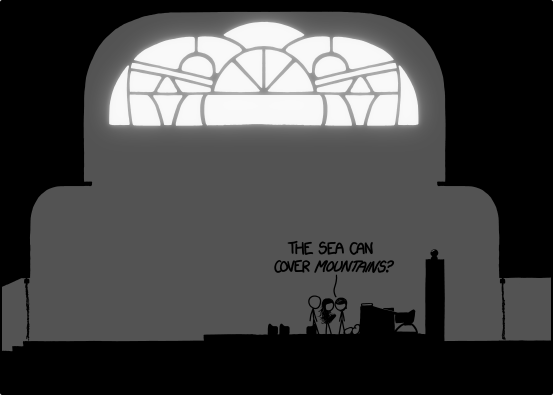 Megan wrote: The sea can cover mountains? lmjb1964 wrote: Someone, I think CasCat, mentioned this also, but could it be related to Basque? Basque isn't related to any known language. Tried that, I think it's too far fetched (tho I could be wrong). For example, in my language (Slavic), water = voda (pronounciation uo-tah = wo-dah), even though languages have evolved separately for about thousand years... and don't get me started on greek/latin origin words (which share roots with proto-indian or something)... they are all the same across all Europe, just pronounced slightly different. Last edited by Gedeon on Fri Jul 19, 2013 2:10 am UTC, edited 3 times in total. I see a dotted (intermittant) river, and some hills. Did anyone get those other Beanie script letters? Now I lay me down to coma. Please spare me, Lord, from dreams filmed by Troma. Please continue the thread, so there'll be cake. I think that these last few frames are, for me at least, where I see the true conflict arising, and thus the story itself beginning. The sea's rising level was a curiosity before, but now it presents a very real (if somewhat slow-moving) danger to all characters involved. Congratulations, everyone! It's been four months and the plot has started to move forwards already. Not me; I'm not much of a linguist. Although I speak fluent Feline. Last edited by CasCat on Fri Jul 19, 2013 2:17 am UTC, edited 1 time in total. That's because of gamma radiation though, not because of heat. Gamma rays don't boil water (or, at least, not nearly as efficiently as visible/infrared light). Edit: 400th post! And at a very baobabish time in the OTC indeed! Last edited by taixzo on Fri Jul 19, 2013 2:25 am UTC, edited 1 time in total. And quite possibly, CueGan don't speak English either. It's just shown to us as such because the story is told from their perspective. Therefore, maybe Cueganese is some exotic language, while Beanish could be indo-european. Just mumbled because our protagonists don't understand it. Last edited by Gedeon on Fri Jul 19, 2013 2:19 am UTC, edited 1 time in total. taixzo wrote: That's because of gamma radiation though, not because of heat. Gamma rays don't boil water (or, at least, not nearly as efficiently as visible/infrared light). We'd probably lose the ozone layer completely if my astrophysics is up to date. What secondary effects would that have? I'm claiming credit in my own head for being the first to propose the Med idea. Hopefully no one will care enough to disabuse me of my notion. Here's the Wikipedia article on the Med drying out "the Mediterranean would mostly evaporate in about a thousand years". I'd buy stock in a sunscreen manufacturer. Clothes would be dyed and cars would be painted with fluorescent colors. George Hamilton would be altogether invisible on dark nights. More UV light getting in. Which would mean more sunburns. But the Sun only emits a minority of its energy in the UV spectrum, so it probably wouldn't contribute much to drying. M32: Shiin is a fit for the first letter, laam annd miim, not so much? By the way, the bottom of the med should be hellish (50C/122F)! @taixzo: serilized means no Cueball and Megan, unless they have gills. Last edited by edo on Fri Jul 19, 2013 2:33 am UTC, edited 1 time in total. taixzo wrote: More UV light getting in. Which would mean more sunburns. But the Sun only emits a minority of its energy in the UV spectrum, so it probably wouldn't contribute much to drying. I'm not suggesting any direct drying effect. I'm thinking more worldwide environmental lever. Or perhaps it's just the event that set the technology clock back. edo wrote: By the way, the bottom of the med should be hellish (50C/122F)! Nope! Just look at all the wild speculation we have just since the explanation - Antares exploding, speculation on the development of beanish, and who even knows what new questions will accompany Cuegan's newfound answers? Kieryn wrote: Did anyone theorize yet as to why the Mediterranean (presumably at the Strait of Gibraltar) was plugged up again at some point in the next few thousand years? If it wasn't plugged up by some volcano or something, then there must have been a sea level drop of about 1500-2000 feet to cut off the sea from the ocean. The only thing that could do that is a severe ice age, the kind of which i don't think would be possible on the timescale of just a few thousand years. It must have been something like a volcano or formation of a super-volcano caldera I guess. A significant temperature drop would also explain how the Cueganites can survive in the heat of the Mediterranean basin, 2½ km below sea level. Last edited by ChronosDragon on Sun Jul 21, 2013 1:07 am UTC, edited 1 time in total. Latent22 wrote: OK OTVO voting time! This is now quarter final voting to see who goes onto the next round and submit a new set audition. For Megan, it was hard to pick, but M2 stands out as having just the right innocence, life, and playfulness. For Cueball, my top choices are C5 (a surprise, actually! ), and close runner-up C1 and C6. For C5, the qualities that do it for me are youthful innocence, coupled with a little goofiness in the tone quality. C6 has a very interesting mix of youth energy and contemplation, which is a nice match for Cueball.